Tropical Storm Harvey continues to affect the Gulf Coast, shutting down refineries and, to a lesser extent, crude production. Already, the storm has had a severe impact, with fourteen lives lost and severe devastation throughout the Gulf. For the entire Mansfield and FUELSNews teams, our thoughts are with those affected by the storm and the families of those who have lost loved ones. Harvey has had a few significant impacts on oil economics. With the storm aimed at one of the largest refining hubs in the world, it was inevitable that oil prices would rise. Numerous refineries shut down as a precaution before the storm, and others were forced out of production by the flooding. Of course, hurricane conditions had a major local impact on prices. 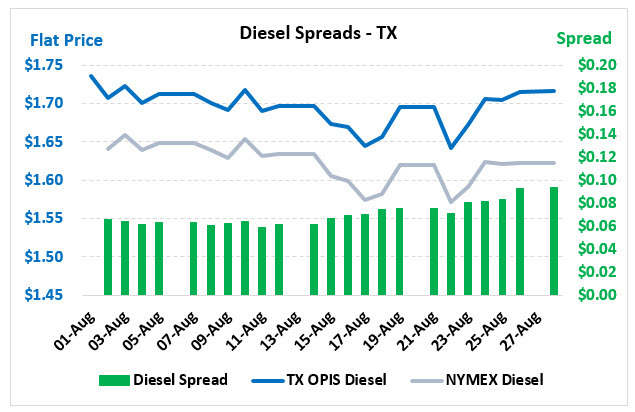 Wholesale prices in Texas for both gasoline and diesel rose relative to NYMEX prices, though the increases were not as dramatic as they could have been. Wholesale gasoline rose to roughly 5 cents over NYMEX prices, up from just a penny at the beginning of the month. Diesel rose from six cents over OPIS to more than 9 cents over OPIS. 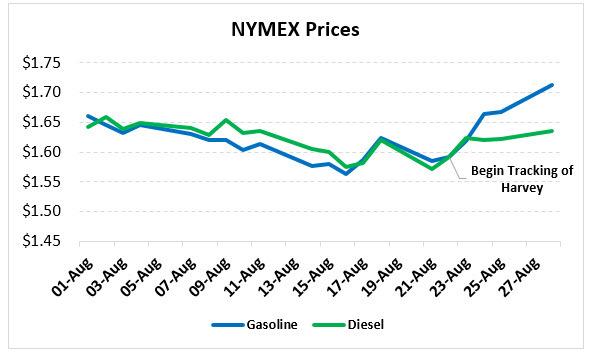 NYMEX prices, the national index for all fuel prices, rose significantly leading up to the storm. Gasoline in particular saw nearly 10 cent gains as the storm took hold, rising from around $1.60 to over $1.70. Diesel has been more flat, and is just beginning to approach $1.65. Fuel crack spreads, the price difference between a barrel of gasoline or diesel and a barrel of crude, has risen to its highest level since 2015. Since 2010, the average diesel crack spread has been roughly $22, while the gasoline spread has been $19. Last year and this year have been substantially below these average levels, but with so many refinery closures, spreads have widened. Today, the diesel crack stands at $22, up from $15 in the first half of 2017. 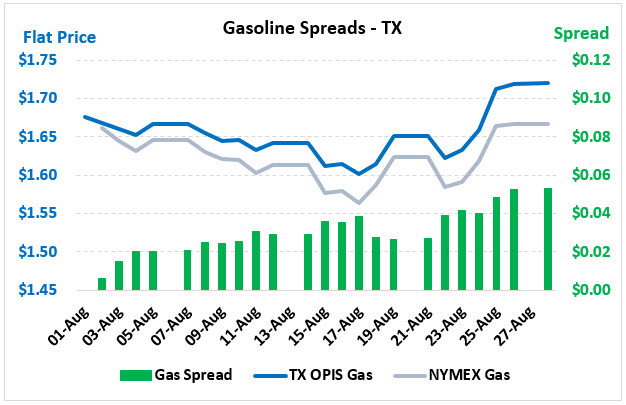 Gasoline crack spreads are even higher – $25 today, compared to $16 in the first half of 2017. While refining capacity in the Gulf Coast has been taken offline, refineries in other parts of the country have more incentive than ever to run at full production rates and capitalize on higher profits. Harvey has also driven WTI-Brent spreads to 2-year highs. The storm has had a significant effect on refineries, but has not taken much crude production offline. For that reason, more crude is being put into inventory in the U.S. that normal, pushing the American oil index, West Texas Intermediate crude, lower. However, Brent crude, the “international” crude price index, has been unaffected by the storm, keeping Brent prices high. 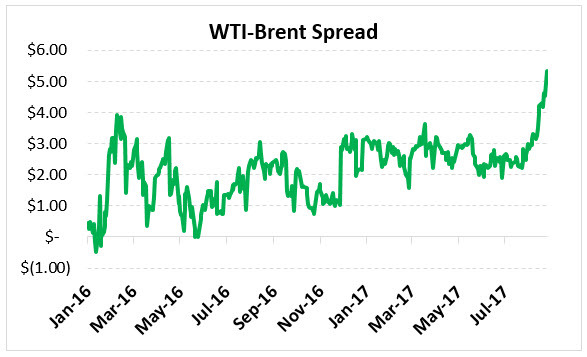 The high WTI-Brent spreads will likely drive exports significantly higher once operations return to normal, helping to bring WTI back in line with where it otherwise would have been. It’s worth noting that ports in the Gulf Coast have been shut down, keeping 600 kbpd of crude oil imports out of the U.S. while trapping the usually 500 kbpd of refined product exports. So far, the effects on international oil economics has not been severe. The IEA, which has a policy of sharing oil with member countries experience a supply shortage greater than 7%, said Monday that they did not see a need to release oil from their stocks to offset the disruption from Harvey. Global inventories are high enough that countries should be able to replace lost gallons from the U.S. However, the organization did say they are monitoring the situation and will step in if necessary to mitigate interruptions in global supplies.